Though some articles on this site might lead you to believe otherwise, I am not usually an enthusiastic shopper. Shopping, for me, is not an end in itself; “retail therapy” has never worked for me. I don’t go out just to see what’s there – I like to have a specific mission. So my classmate Deepu has been gamely escorting us all over Bombay, on the hunt for the perfect sari. This has turned out to be an endurance event, though the shops strive to make it pleasant. 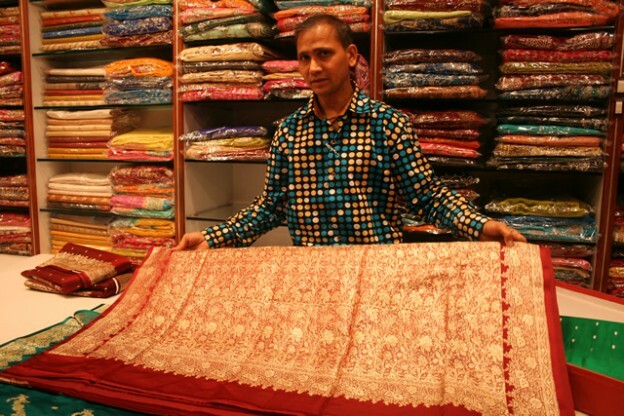 A sari shop usually features a soft surface covered in taut, spotless white cloth. In the first place we visited, this was a counter that the salesman stood behind, and we had comfy chairs to sit on – refreshments were offered as well. In the next shop (pictured above), the surface was a low platform, wide enough for the salesman to sit on, while we sat on cushioned benches. In the third and most traditional, we sat on the cloth-covered floor (shoes off at the door) and reclined on bolsters, while the salesman sat cross-legged in front of us. This was very hard on the knees after a while – I’m too creaky to sit that way for long. …from which he unfolds meter after meter of textile miracles. 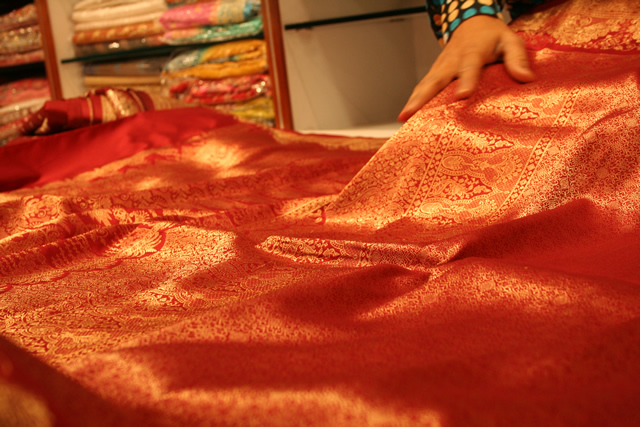 These are Benares brocades, an ancient art that may be dying out because it’s not in sync with modern tastes. …while the rejects are folded back into their boxes. 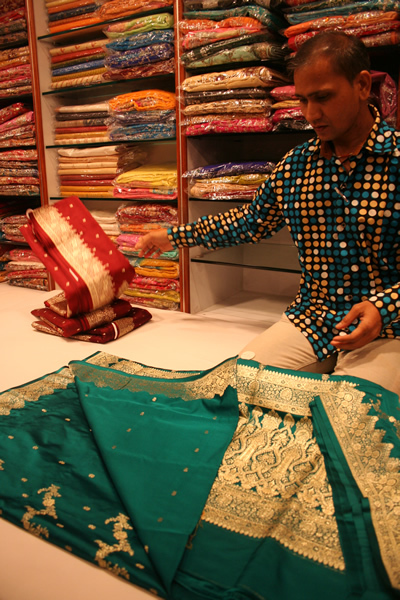 Like every other organization in India, sari shops swarm with employees – assistants stand ready to do the folding. Prices range from Rs. 2000 into the stratosphere, depending on the quality of the material, whether the gold is real, and how much of it is woven into the material. A very fancy wedding sari can be heavy to wear from the sheer weight of precious metal in it. Though they can be expensive, a good sari lasts practically forever, always fits (you can have new blouses made to wear underneath), and can be handed on to your daughters. later – It took us until this evening – and an hour at a fourth store – to actually buy anything. But I won’t describe it, so as not to spoil the surprise. Suffice to say that Ross will look stunning! photo top: At a large sari shop in Santa Cruz. The gentleman got nervous after a while and asked me to stop taking photos. This entry was posted in India and tagged India, India shopping on December 26, 2007 by Deirdre Straughan.